Told in two parts, Owl begins with a new friendship in the heat of the Overberg summer between two ten-year-old girls, and finds them again six years later. It’s an honest picture of growing up different in the middle of nowhere; a story about climbing trees, punching boys and kissing girls. A story about growing up where nothing grows. Briony Horwitz performs Jon Keevy’s script under his direction with choreography by Fiona Du Plooy and music by Brydon Bolton. The début run of Owl was from the 21st February to the 2nd March at the Intimate Theatre. 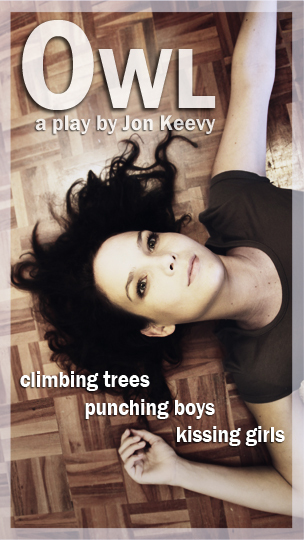 It then ran from the 30th April to 5th May at the Kalk Bay Theatre. At the National Arts Festival in Grahamstown it ran from the 28th June to the 7th July as part of the Cape Town Edge. Immediately following this it was part of the Schools Festival from the 10th to the 13th July. Owl will next be performed as part of the Arts Alive Festival in Joburg from the 6th to the 8th of September and then at the Nieu Bethesda Fest from the 21st to the 23rd September. Jon Keevy has trouble remembering what sort of bio he should be writing – a writer? A designer? A director? A production manager? Like many people hustling in the theatre industry he has to be more than one of these at any given time and especially for this, his most personal play so far. 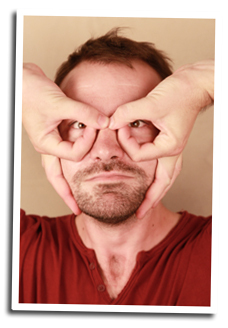 So, general facts first: He graduated from UCT in 2007 for the 3rd time with an MA in theatre-making and started making theatre with Bosnian-born director Sanjin Muftic, a long time collaborator on many ill-advised schemes. Together they’ve produced four plays at the National Arts Festival, toured to Rwanda and Knysna, ran an underground theatre until the cops shut it down, created projections for operas directed by Lara Bye and generally kept themselves busy. 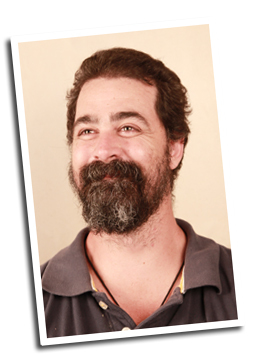 Jon fits his writing schedule and his crazy collaborations with people like Jason Potgieter, Kim Kerfoot and Sanjin around pretending to be a stage manager so he can watch firsthand how great directors and writers work. In this way he’s managed to steal ideas and techniques from Lara Bye, Chris Weare, Geoff Hyland, Alan Committie, Peter Krummeck, Mike van Graan and Lara Foot-Newton. He possesses many strange skills like swordfighting, aikido, latex casting, puppet building and origami. Briony Horwitz is an incredible and versatile actress. Her theatre experience includes extensive South African tours with children’s theatre productions Rapunzel, Princess and the Pea and Charlotte’s Web. In 2009 she played Lady Capulet in Romeo and Juliet Unplugged, directed by Anthea Thompson. As a theatre-maker, Briony’s offerings include Spice: Feast and Fable and the Rock Tribute Woman of Rock. She has also been involved in the creation of educational theatre pieces like The Marvelous Adventures of Lex and has facilitated teenagers in developing their own work, notably the Western Cape Department of Sports and Culture funded The Clock is Tikking. 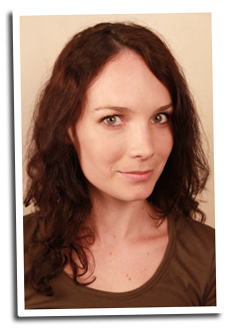 Briony graduated from UCT with a BA in Theatre and Performance in 2006 and was nominated in the Fleur du Cap’s ‘Most Promising Student’ category. She and went straight into co-running the Cape Town collaborative theatre company, The Chameleon Collective for two years. They created imaginative and challenging children’s theatre as well as avant-garde physical pieces. Her film credits include leads in Karoo (Winner of the 2011 SAFTA for ‘Best Short Film’) and Wounded (due to be released in 2012) and plays Zoe Harris in the M-Net soap opera The Wild. 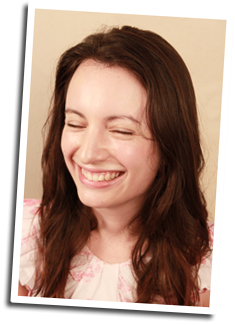 Briony has diverse interests and training in singing, dancing, puppetry and martial arts. Brydon Bolton has magic. His music is visceral and intricate, driven by an open and giving passion for art. He is a musician, composer and educator, while regularly performing at local and international festivals. He started playing double bass in a small industrial coastal town called Port Elizabeth. He learnt classical technique at an academy from a Yugoslavian cellist and jazz improvisation from the jazz players in the black and coloured townships surrounding PE. Brydon has performed and recorded with many renowned South African musicians, such as Alex van Heerden, Derek Gripper, Robbie Jansen, Tony Cox and Frank Mallows. He is a regular performer on the Cape Town music scene with various groups, notably Benguela. Brydon is also a music educator, sound artist, curator of music and sound events, composer of contemporary classical music, and a sound designer for dance and theatre performances. Over the years, he has collaborated with various individuals, including poets, playwrights, dancers and artists. His work focuses on developing music and sound forms that challenge idiomatic or conventional expressions. This is the third play that he and Jon have worked on together creatively. 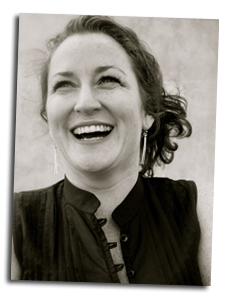 Fiona Du Plooy is a choreographer whose evocative visual style, comprehensive movement vocabulary and extensive knowledge of ballet and contemporary dance has been seen in work created for both theatre and television. As well as conceptualising her own work, she has an intuitive ability to respond to the artistic vision of others in a range of disciplines and media; and has collaborated with experimental visual theatre makers as well as mainstream television producers. Fiona has an incisive wit and an ability to express comic timing and irony in movement, delighting audiences with her choreography in Angels on Horseback, Not the Midnight Mass and I Am Here. This light touch is in sharp contrast to the intellectual rigour and gravitas of her more serious work. Fiona is a UCT Drama Gradate with an Advanced Ballet Diploma and a National Pilates Qualification: she has spent 2 years assisting renowned international choreographer professor Jay Pather, coordinated and taught Movement Studies for 4 years at CAP (Community Arts Project ) and worked as contemporary Dance Teacher in Zama Dance School, Gugulethu. She now teaches Physical Theatre Movement Technique for performance students at the UCT Drama Department. Fiona operates as a freelance performer and choreographer within the local film, television and corporate theatre industry – a highlight was choreographing the 2010 Castle Lite Ice Ice Baby campaign with Plank Productions. Gabriella Pinto is the mighty stage manager of the show. She graduated from UCT in 2011 with a theatre-making degree. This is her first year out in the real world and together with Iman Isaacs she has already put together a company. They’re off to Grahamstown festival with their first professional offering, Eden. She describes herself in short statements: A Theatre-Maker. A Bibliophile. An Aesthetic Addict. A Chocoholic. This entry was posted in Projects and tagged Briony Horwitz, Brydon Bolton, Cape Town Theatre, Fiona Du Plooy, Gabriella Pinto, Intimate Theatre, Jon Keevy, Owl the play. Bookmark the permalink.